I was walking along the upper Eldred River and came upon this lovely red flower. It's the Red Columbine, also known scien- tifically as Aquilegia formosa. The Columbine is a perennial plant, returning each spring with beautiful bright red blooms with yellow centers. Tall thin stems rise from the green leaves lying close to the ground. Look for Columbines in moist areas such as meadows, along lakes and streams (that's where I found mine), in clearings, and even on rocky slopes. 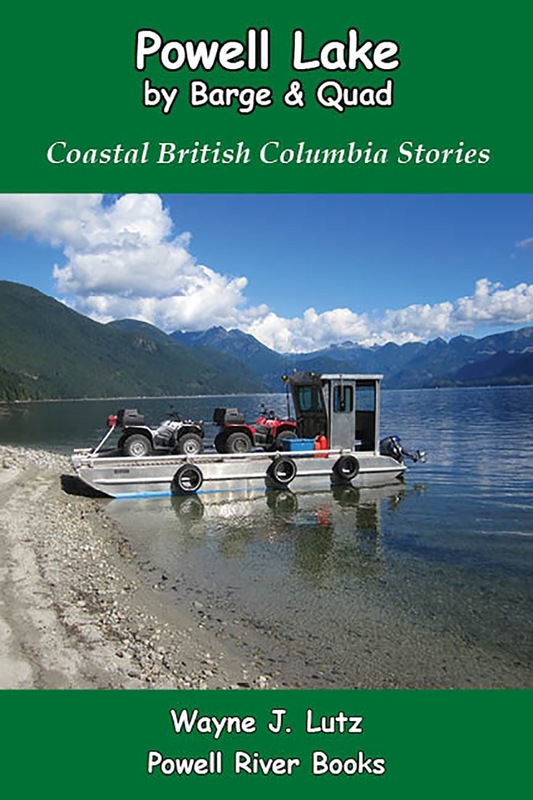 When Wayne and I first came to Coastal BC, we wanted to learn more about boats so we could cruise in this amazing place. One of the first books we read was The Curve of Time by M. Wyle Blanchet. 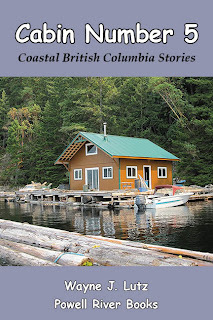 It's a classic about a widow, her five children, and dog who traveled the challenging BC coast in the Caprice, a 25-foot cedar hulled cruiser, during the 1920's and 30's. The rugged and beautiful BC coast. As Capi (Muriel Blanchet's nickname) and her youthful crew plied the waterways and anchorages, they met many coastal characters and critters. The BC coast is one place where the population has actually declined. Reading about these hardy individualists, along with Muriel's experiences, took me back to a time when my new home was a much more remote and rugged place. 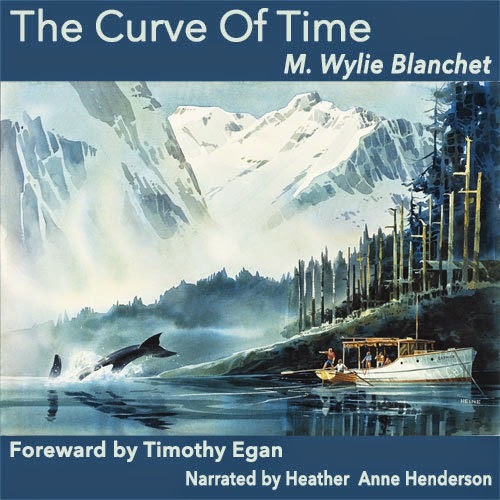 An audiobook version of M. Wyle Blanchet's classic The Curve of Time narrated by Heather Anne Henderson has just been released. You can read more about it on Heather's blog by clicking here. Also, there's a YouTube trailer you can watch. The amazing thing, Heather's voice really makes me think that Capi is telling the story herself. Start of new nest on clothesline. In May I shared a post about Barn Swallows building a nest at the back of our cabin. All seemed fine. The pair completed their nest and had five chicks. We tried to stay away, but one day I saw a dead baby on the deck. By the time Wayne went to remove it there four dead babies, no more sounds from the nest, and the parents disappeared. We were at a loss for what happened. A week later the pair returned frantic to build a new nest at the front of the cabin. We had hoped they would refurbish the old one. When we went out back to remove it, we sadly discovered a dead fledgling inside. No wonder they had to move for their second brood. Mom working on the nest with mud and grass. After a week of stuffing newspaper around the front of the cabin, we gave up and let them choose their spot. We wanted enough time for the babies to mature for their long migration south by late summer. Dad waiting nearby with mud in his beak. They decided to build on top of our clothes line. It looks extremely precarious and is right outside our side porch door. There's no way we can stay away from them completely, but nature must take its course. I again used plastic to protect our wall, table, and deck from all the droppings. From laying to fledging it will take about five to six weeks. I guess we can live with it that long. Kurt arrives in his Husky floatplane. Last week we had a visitor to Hole in the Wall. Kurt arrived from the States in his Aviat Husky floatplane and stayed across from us in our good friend John's Cabin #2. While Kurt was here, he took John for a ride up to Daniels Lake. John at Daniels Lake, BC. Photo by Kurt. Daniels Lake is extremely difficult to reach by means other than floatplane or helicopter. This sub-alpine location placed the guys on crystal blue waters near year-round glaciers. Reflections on remote Daniels Lake. Photo by John. From here, the Daniels River plunges down granite cliffs through well worn gorges to merge with Powell River and ultimately feeds Powell Lake. Daniels River, BC. Photo by John. Everywhere you walk in the forests of Coastal British Columbia, you find Bracken Fern. Large lacy fronds radiate from a central point and can reach heights over 3 metres (10 feet). 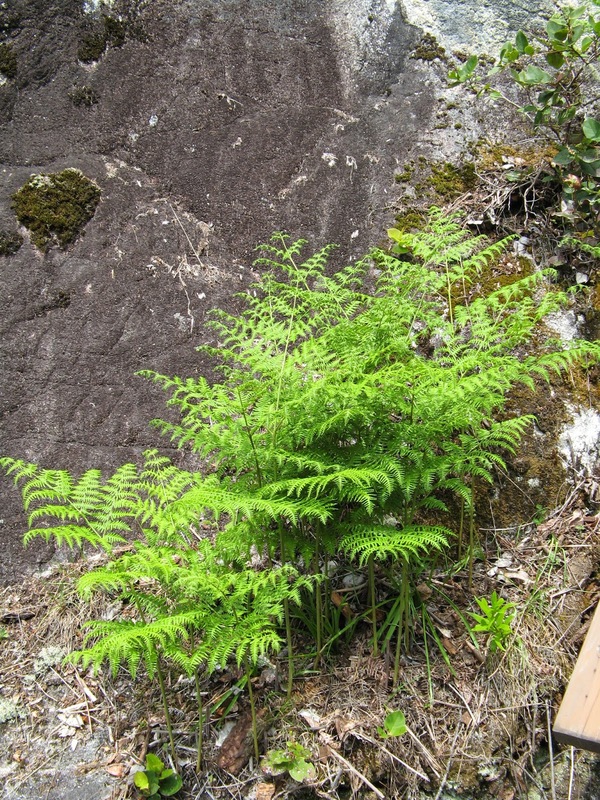 In BC, most Bracken Ferns are from the genus Pteridium species aquilinum and subspecies lanuginosum. The ferns grow from an underground rhizome and are perennial, lasting from year to year. In winter, the fronds die back and regrow from small curled shoots (fiddleheads) that emerge in spring. Bracken Ferns grow in both sunny and shady spots, and in dry to moist soil. This allows them to be plentiful throughout the region. Some preferred locations to find Bracken Ferns are in recently cut or burned sites where they are among the first plants to return, and along forest trails. Along the granite cliff and on the hill above our cabin we have lots of Bracken Ferns. I love their graceful leaves and bright green colour. Last week we hosted a crew from Red Letter Films in Surrey, BC. They came to our float cabin home to tape a segment for an upcoming television “magazine style” series called Chalet de la Cote Ouest about unique cottages and chalets in British Columbia. Red Letter Films is producing this series for a new French language television network called Unis (a division of TV5). The logistics were all coordinated by Dan. It must have been a monumental task to get the host and film crew from location to location in a quick and orderly fashion in order to meet the airing deadline in November. On Thursday, July 17, the show's host Evelyne, camera technician Catherine (Cat), and assistant camera tech Creighton (Crey) met Wayne and me at the Shinglemill dock with equipment in hand. We transported them up the lake in our barge and boat. Here's Cat filming from the bow as the rest of us ride in a bit more luxury in the boat. One unique aspect of the filming was that it was in French. Evelyne would first ask a question in French and then translate it into English for us. Wayne's and my responses will be dubbed into French during editing. I wonder how we will sound. It was fun to share our unique home in this special way. We feel so fortunate to have discovered it by accident in 2001 while we were on a flying vacation to BC. In the early days, it was a vacation getaway. Now it's our full-time home, and we wouldn't want it any other way. Alder is a good place to start, not only because it's the first letter of the alphabet, but Alders are a common tree in Coastal BC. 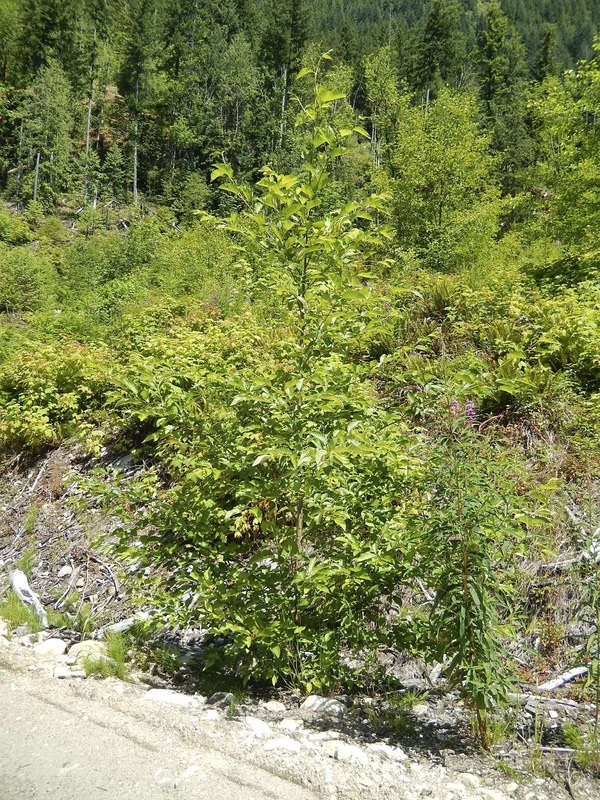 The Red Alder is found most predominately in open areas that have recently been disturbed such as roadbeds and logging slashes. Alders almost immediately take a foothold in the once shaded area that's now exposed to full sun. It's considered a weed (even though it becomes a full grown tree) because of its persistent and pervasive nature. The Alder is an important part of the regeneration of a forest. Forest succession is a process of death and rebirth. On a natural scale, the Alder is one of the good guys. In a forest replanted with evergreens (cedars, firs, pines), the lowly Alder isn't as welcome. Even though it's a nitrogen-fixer and adds richness to the compost on the forest floor, it strangles out newly planted trees that are being grown for profit. Alders provide an almost instant green cover to brown forested areas. 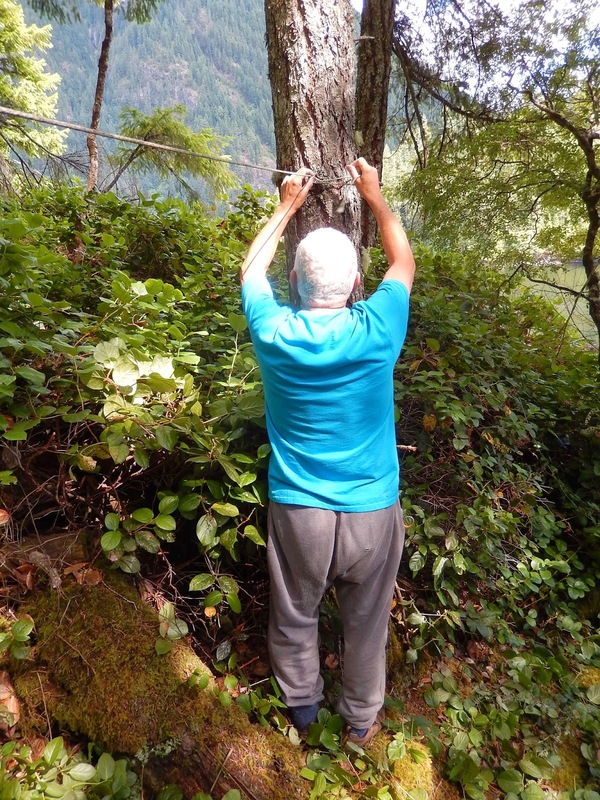 They join berries and shrubs in providing borders along steep logging roads. For someone like me with a fear of heights, that's a huge plus. Over the years, as a result of composting, I've developed a plot of soil on our exposed granite cliff. The down side of using this area for gardening is limited access to water. It's a long haul with heavy buckets climbing four flights of stairs up from the lake. 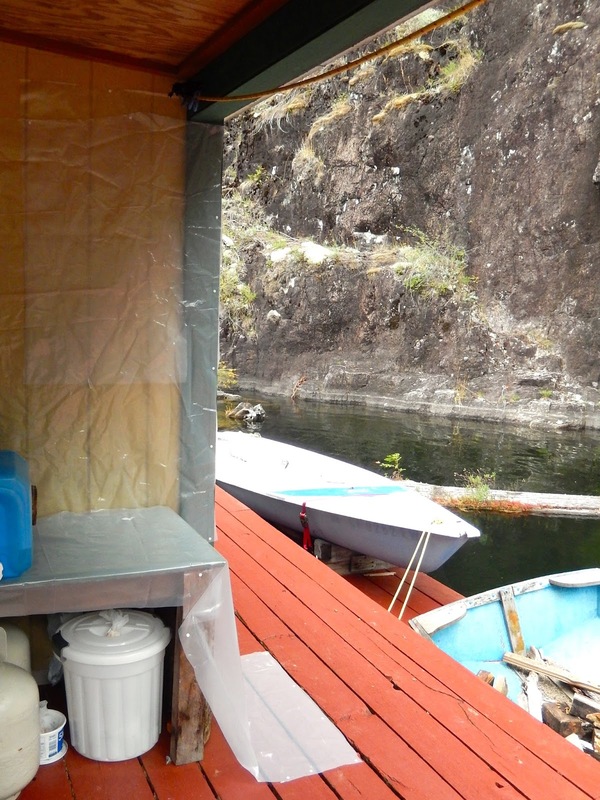 Our good friend John devised a rain water collection system using a 55-gallon plastic barrel and a tarp suspended from trees. It's situated above my plot, so gravity provides enough pressure to water my plants. Summer gets pretty dry, so my one barrel didn't last long. John upgraded me to a double-barreled watering system. The plastic barrels will probably outlive me, but the tarp has been exposed to rain, sun, snow and wind for about ten years. It needed to be replaced to make sure both of my barrels were filled before the last rains of the season. We purchased a heavy duty woven polyethylene tarp that was UV resistant. Wayne had to resize a larger tarp because there were no longer any of the exact dimensions we had before. I purchased a grommet kit so we could place connection points that matched our tree attachment locations. While the tarp had disintegrated over the years, the clothes line cording was still in good shape. We untied the old tarp and put the new one up in it's place. With both of us working together it took over an hour. John probably completed the initial installation all by himself in half the time. But it made us feel good we could do it ourselves. 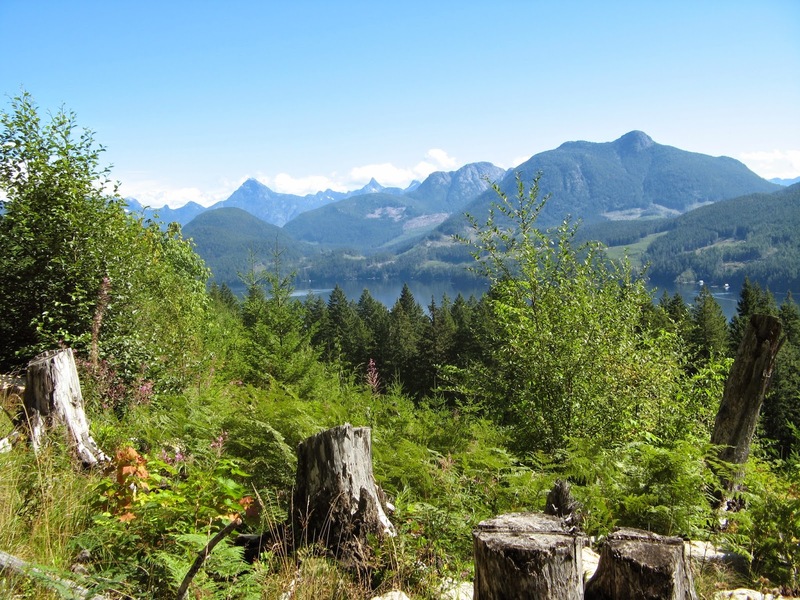 Mainland Roosevelt Elk Recovery Project (LMRERP) began in 2000 as a response to a combined need to both control nuisance Roosevelt elk along the urban fringe of the Sunshine Coast and fulfill the desire to continue re-establishing historic Roosevelt elk ranges in the Lower Mainland Region. 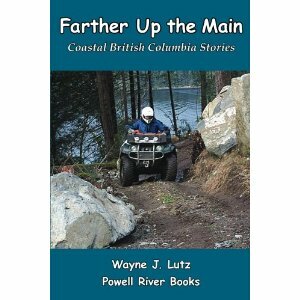 Available Online: "Flying the Pacific Northwest"
Lately, Wayne and I've been camping on Powell Lake using our barge as a tent platform. Being right on the water, we are getting some wonderful sunset and twilight sky and water reflections. This one is looking west from the Shermans logging dock near the Rainbow Lodge area. This week I've been hearing a high pitched whistle from the trees around the cabin. It wasn't a familiar sound. I thought it might be a bat, but the time of day was wrong. Then one evening Wayne called me out to the float garden. A small flock of Cedar Waxwings weas foraging. When I used my Bird Songs Bible, I discovered they were the source of the sound. 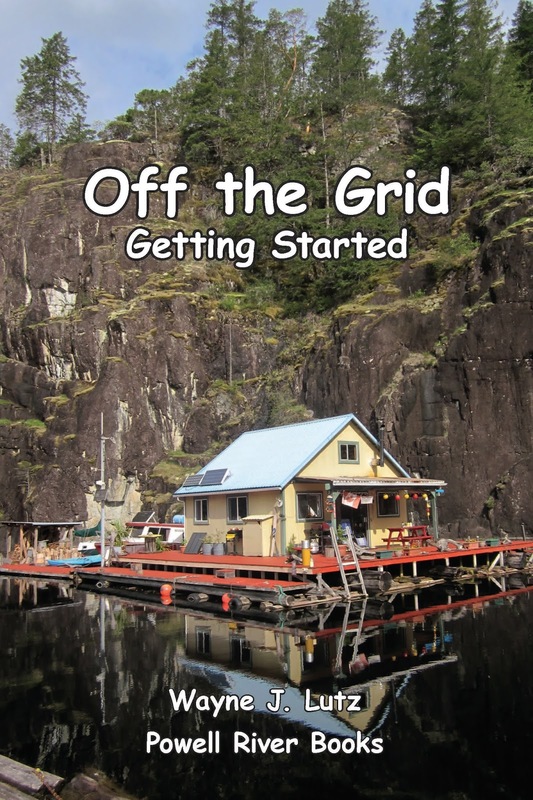 This book is a great resource for off-the-grid (and Internet) living. Cedar Waxwings aren't common around our cabin. They are fruit eaters, so I wasn't too worried about my veggies. They stayed quite a while for us to watch. They were most interested in the egg shells I had in the garden. They may not work to deter slugs, but they seem to be something the Cedar Waxwings like in their diet, most likely for calcium and grit for digestion.